Mataram, Aug 6 (Just News): Rescue workers found chaos and destruction across the Indonesian resort island of Lombok on Monday after a magnitude 6.9 earthquake killed at least 91 people and prompted an exodus of tourists rattled by the second powerful quake in a week. 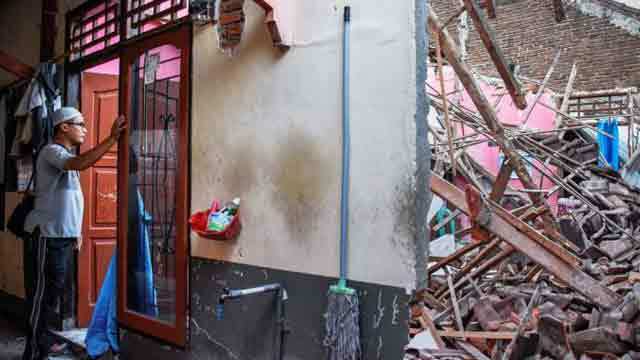 The National Disaster Mitigation Agency (BNPB) said the death toll was expected to rise as information came in from areas where thousands of buildings collapsed or were badly damaged, especially in the north, the quake's epicentre. Lombok was hit a week earlier, on 29 July, by a 6.4 magnitude quake that killed 17 people, injured hundreds and briefly stranded several hundred trekkers on the slopes of a volcano. The Indonesian Agency for Meteorology, Climatology and Geophysics (BMKG) said that more than 120 aftershocks were recorded after Sunday evening's quake, whose magnitude the U.S. Geological Survey revised down to 6.9 from an original 7.0. There were no foreigners among the dead and the number of injured stood at 209, BNPB spokesman Sutopo Purwo Nugroho told a news conference. The tremor was so powerful it was felt on the neighbouring island of Bali where, according to BNPB, two people died. "This is it for me in Indonesia"
Long lines formed at the airport of Lombok's main town, Mataram, as foreign visitors cut their holidays short. The Garuda Indonesia airline said it was adding extra flights from Lombok to help tourists leave. AirAsia Group CEO Tony Fernandes tweeted that the budget airline would try to lay on extra flights, while Indonesian budget carriers Lion Air and Citilink said there had been a jump in demand for outbound flights from Lombok and Bali. "I was at the rooftop of my hotel and the building started swaying very hard. It felt like two metres to the left, then two metres to the right, I could not stand up," said Gino Poggiali, a 43-year-old Frenchman, who was with his wife and two children, at the Lombok airport. His wife Maude, 44, said the family were on Bali for the first quake and Lombok for the second. "This is it for me in Indonesia," she said. "Next time we will stay in France or somewhere close." Carlos Romartinez, a 24-year-old Spaniard who was also waiting for a flight out of Lombok, said he had decided to head instead to the island of Flores to the east. "All the activities are shut down. We can't dive, we can't do anything so we will go to another island," he said. Dutch tourist Marc Ganbuwalba injured his knee as a stampede of diners rushed from a restaurant after the quake. "We are cutting short our holiday because I can't walk and we're just not in the mood anymore, more in the mood to see our loved ones," said the 26-year-old, sitting on a trolley with his leg bandaged. "We are just thankful to god and also to the hotel staff who really helped us. Some of them said their own houses had been destroyed but they were still helping us." About 1,000 foreign and domestic tourists were evacuated in boats from the three Gili islands off the northwest coast of Lombok, BNPB spokesman Nugroho said via Twitter. He posted a video showing a crowd of hundreds of people crammed on a beach at one of the Gilis, apparently waiting to be ferried back to the main island. Singapore law and home affairs minister K. Shanmugam, who was on the 10th floor of a hotel in Mataram when the quake struck, said that his room shook violently and walls cracked. "It was quite impossible to stand up. Heard screams. Came out, and made my way down a staircase, while building was still shaking. Power went out for a while. Lots of cracks, fallen doors," he wrote on Facebook. His government issued a travel notice, advising citizens to defer travel to Lombok and urging those currently there to leave.